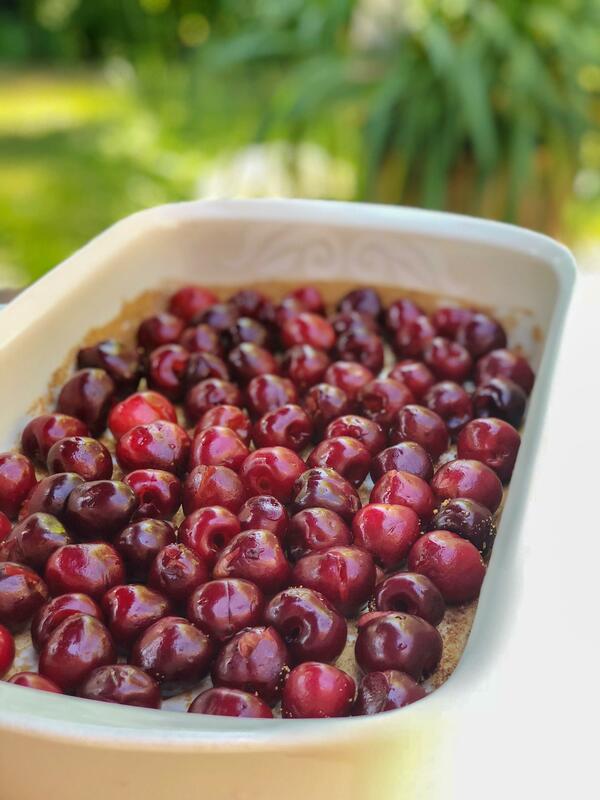 If you’ve not made cherry clafoutis before, you’ll be delighted to find out what an easy dessert it is to prepare, for a lot of payoff! 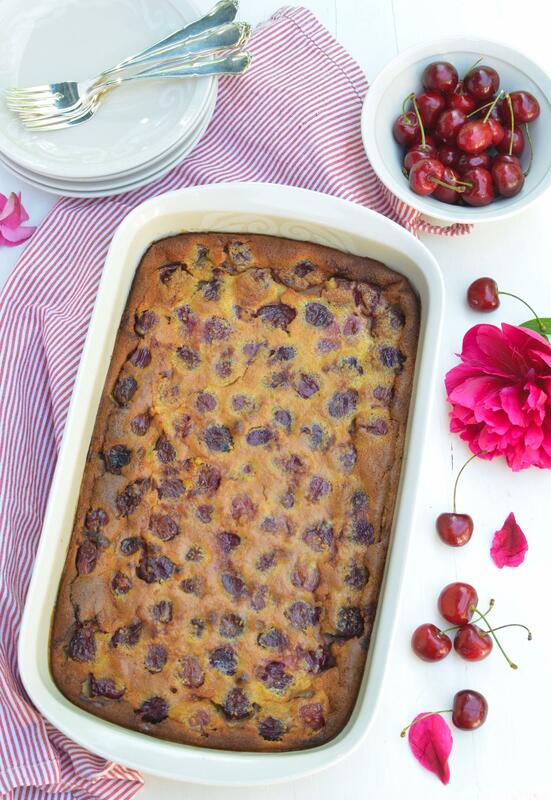 Clafoutis (say ‘kla-foo-tee’) is a traditional French dessert, where juicy cherries are layered in a buttered dish, topped with a creamy batter and baked in the oven. While we consider it as a simple country dessert, it is an elegant way to end a summer meal. Clafoutis originates from the Limousin region in the south-central part of France. 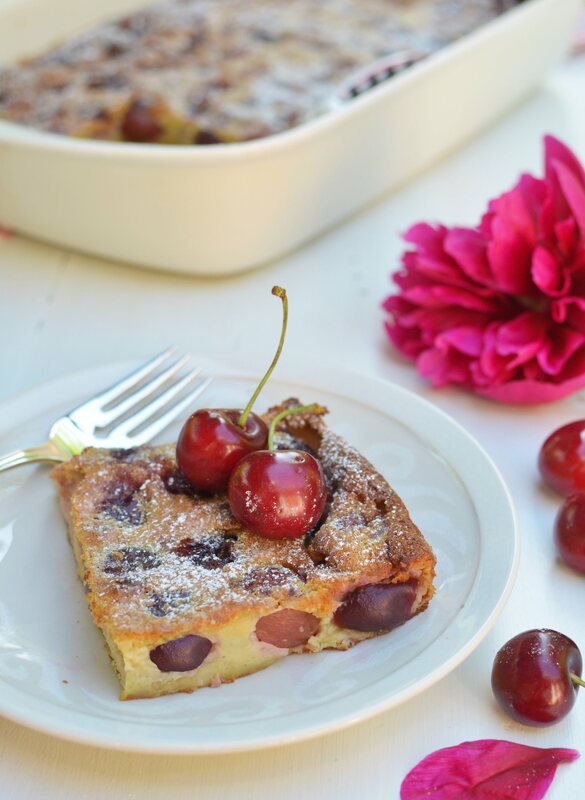 Traditional clafoutis is made with whole cherries. I emphasize whole, as for a lot of French cooks removing the pits is a sacrilège. It supposedly gives depth of flavour to the batter. 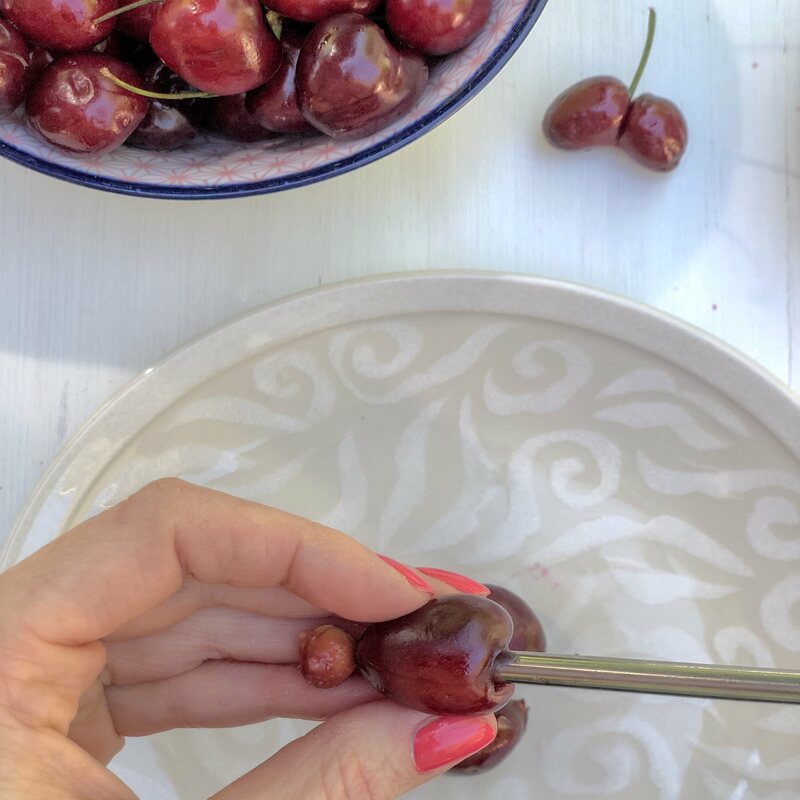 I personally prefer pitting the cherries, so my clafoutis easier to eat (no spitting involved), all the more when having small children around the table. Now how do you pit cherries without loosing part of the juice and tearing them apart? I used to pit cherries with a paperclip, the classic trick when you don’t own a pitter. It does work but I always ended up with a messy kitchen counter. I had to be more inventive, so I came up with the idea of using a BIC pen ‘tube’, simply removing the cartridge (no dull moment in my kitchen). That’s when I remembered the metallic straw I got from a cocktail tasting: EUREKA! I made that little video to show you how I do it (my very first blog video, yey! Would you like more?) Simply by pushing through the top of the cherry, the pit would come out cleanly from the other side, et voilà! It probably works with any straw, firm enough to pierce through a cherry (or else remember my pen trick). The clafoutis batter is made with basic ingredients: eggs, sugar, flour, milk and a hint of vanilla. For this clafoutis I used almond powder together with starch, and added cream to the batter for a richer texture. It all comes together in minutes, and after 45 minutes in the oven, you are rewarded with a heavenly scented kitchen and a wonderful dessert! Instead of regular sugar I used a mix of coconut sugar and birch sugar. Note that coconut sugar will make your custard slightly darker, that’s why I use it for only half of the sugar quantity. Many of my friends have nuts intolerance, in which case I simply replace almond powder with rice flour. Other stone fruits would also work well in this dish, such as nectarine, my second favourite clafoutis flavour. Feel free to personalize your clafoutis! 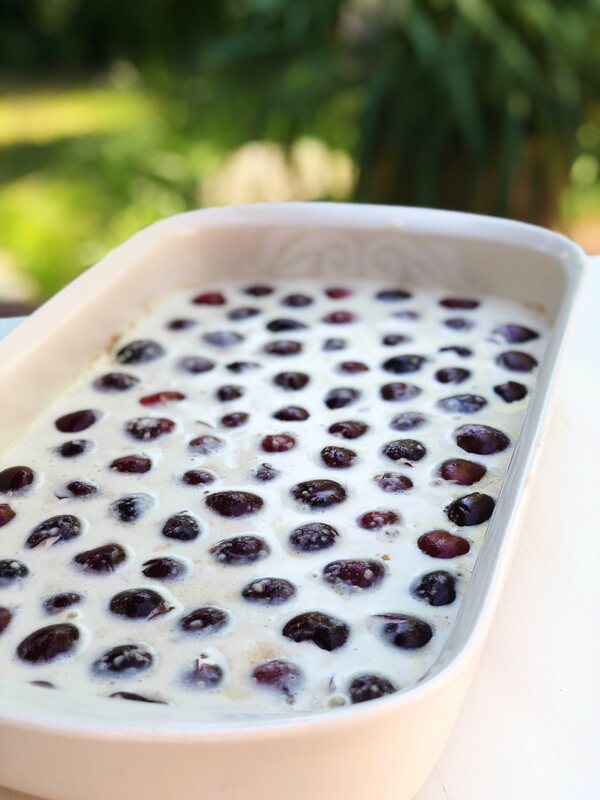 A classic French country dessert, clafoutis is made of fresh cherries buried in a thick vanilla flavored custard. The perfect summer dessert, easy to prepare and oh so delicious! Wash and pit the cherries. Place the almond powder, corn starch, sugar, vanilla powder and eggs in a large bowl and whisk together. Stir in the cream and milk. Butter a baking dish (mine is 33x20cm). Sprinkle coconut sugar to coat the bottom of the pan. Scatter the cherries and gently pour the clafoutis batter over. Bake for 45 minutes, until golden brown and puffy. Let the clafoutis cool down a little before serving. Dust with powdered sugar to finish it off. L'incontournable des desserts d'été, le clafoutis aux cerises, version sans gluten, facile à préparer et tellement délicieux! Mettre la poudre d'amande, la fécule, le sucre, la poudre de vanille et les oeufs dans un récipient et battre au fouet. Incorporer le lait et la crème. Beurrer un moule (le mien fait 33x20cm). Saupoudrer de sucre de coco. Ajouter les cerises et verser la préparation par dessus. Mettre au four pour 45 minutes, jusqu'à ce que le clafoutis soit doré et gonflé. Laisser un refroidir quelques instants, saupoudrer de sucre glace et servir.